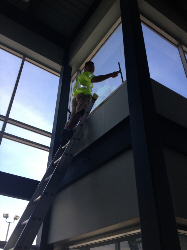 A Glass Act Window Cleaning is insured for $5 Million Liability and Property Damage. Our Employees are also insured by the Workplace Safety & Insurance Board (WSIB). Management at A Glass Act is vitally interested in the health and safety of it's employees. Protection of employees from injury is a major continuing objective. Employees are trained thoroughly for the type of work that they are required to do. Although the Water Fed Pole System has reduced the need for large extension ladders, employees using ladders always ensure safety is their first concern. © A Glass Act - 2014 All Rights Reserved.